May F. Chung, Part-Time Lecturer, is a native North Carolinian. Prior to teaching English at UMBC, she taught Composition at her alma mater, the English Language Institute at UMBC, and at the Community College of Baltimore County, Catonsville Campus. She also has previous experiences with working with English language learners from elementary school to college-aged students in the United States, China, and Guatemala. 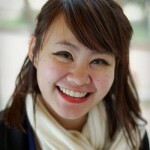 May is currently a PhD student in Language, Literacy, and Culture at UMBC.